Far more than a barbecue - the Kamado Joe range of garden stoves are incredibly versatile; able to grill, smoke, and bake (even pizza). A technological development from the traditional Japanese Kamado stove, the ceramic construction makes an efficient cooking vessel and the lid turns the whole cooker from a grill to an oven. 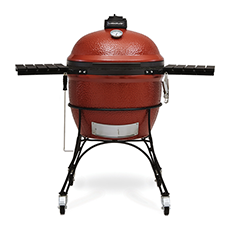 Kamado Joe 'Big Joe' 24"
The "workhorse of the grill world" is there to provide all the outdoor cooking capability you could ever need. Far more flexible than a barbecue, the Big Joe includes split, multi-position stainless steel racks, as well as halved grates and heat deflectors, allowing you to divide the use of the cooking area for different purposes.